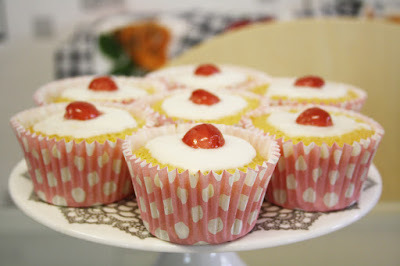 Gluten free cherry bakewell cupcakes. 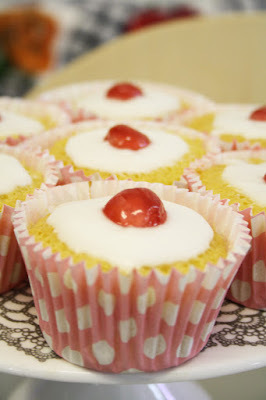 These cupcakes are rather exceedingly good.. inspired by the classic cherry bakewell, this batch of scrumptious cupcakes takes the flavours of the almond treat and wraps them up in a moist, fluffy, cupcake case. Hands down, these are by far the best gluten free cupcakes I've baked yet, adding ground almonds into the mix gives them a fluffy, moist texture, even making for a long lasting bake – the cupcakes that did survive lasted for a few days in their container, and they still tasted just as scrumptious as the day they were baked! Definitely worth a try! 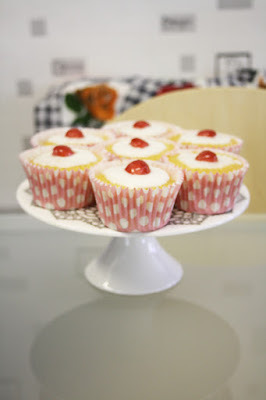 They're also dairy free, so a great bake if your lactose & gluten intolerant too. In a large bowl cream together the stork and sugar till pale and fluffy – any dairy free margarine will also be perfect if you'd prefer not to use stork for your bake. Add in the eggs one at a time, and mix. Then add the cherry flavouring and stir – this will add a scrumptious taste to your cupcakes, recreating the cherry bakewell flavour. I used's Beau's concentrated flavouring for mine, just adding a couple of drops – a little goes a long way! Sift in the gluten free self raising flour a little at a time and mix, then add in the ground almonds and blend – this mix will add a fluffier texture to your cupcakes, as well as re-creating the classic cherry bakewell taste. 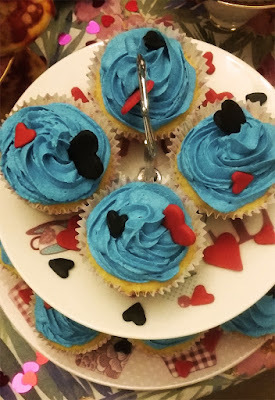 For my cupcakes I used Doves Farm self raising flour blend, mixed in with ground almonds that I'd picked up from Home Bargains – they're much cheaper than most supermarkets/health stores and still just as good! (Not cake related, but they're also worth visiting for their Gluten free pasta, it's sooo much cheaper than anywhere else, and ridiculously delicious). Once mixed, spoon the cupcake batter into the cupcake cases and bake for 15-20 minutes till risen. 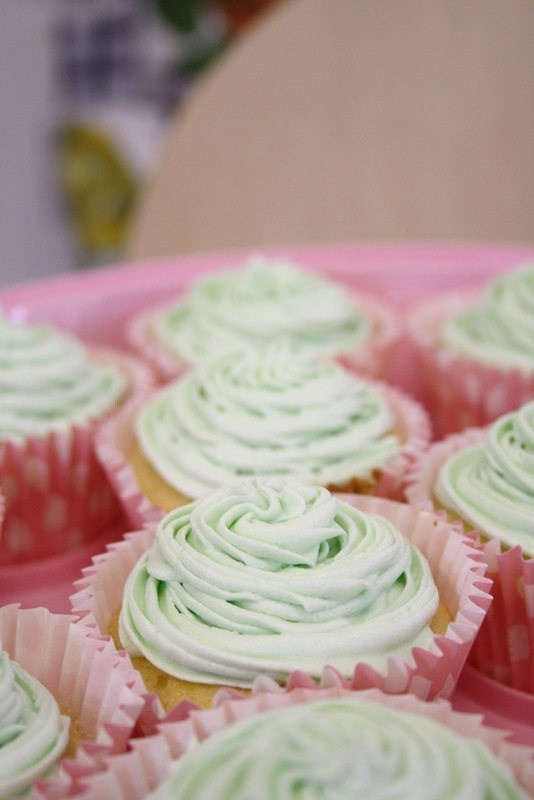 Remove the tray from the oven and leave your cupcakes to cool in the tin for 5 minutes, before removing and placing on a wire rack to cool down. Once cooled, start mixing your icing. These cupcakes are topped off with a classic water icing – much like your traditional cherry bakewell, making for a lovely finish. Sift the icing sugar into a bowl, then add a couple of teaspoons of the lemon juice to bring the mixture together, keep adding a teaspoon at a time to mix to the right consistency - it should feel slightly stiff as you mix, and as you take the spoon out of the bowl it should drizzle off slowly, if it looks too runny simply sift in more icing sugar and mix. Once mixed, take a palette knife and place a generous helping of your icing on top of each cupcake and smooth the icing on top to finish. 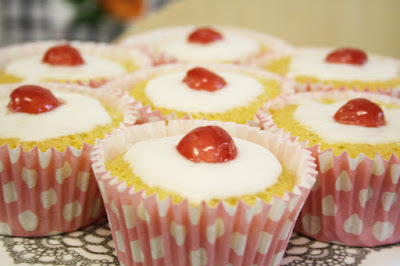 Top off with a glace cherry half – your cherry bakewell cupcakes are complete! Certainly a yummy take on the classic treat, and by far one of the best batches of gluten free cupcakes I've made so far. 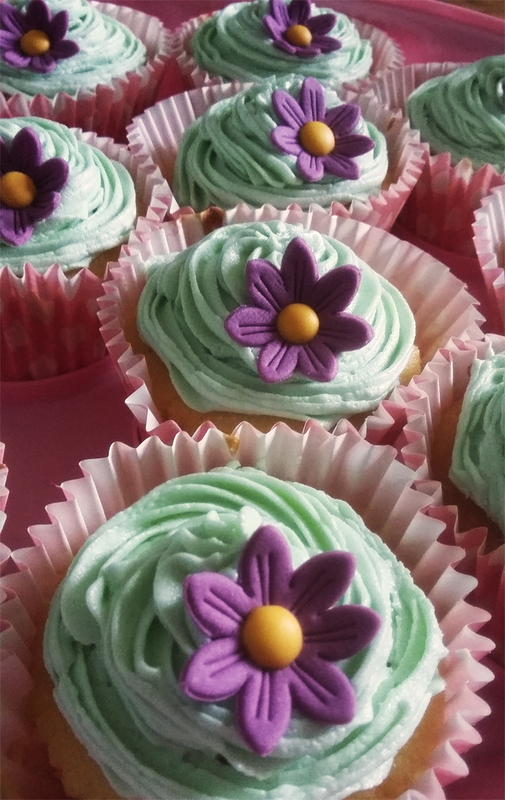 They're perfect for any time of the day – heck, just bake a batch because you fancy some cupcakes, you don't need any excuse! We've all been there, after you've piped frosting on top of two dozen cupcakes your about ready to give up, but then your faced with a plethora of pretty edible decorations to finish them off, that's when the swearing really kicks in... Let's face it, for us amateur bakers we don't often have the time (or patience) to create baking perfection with every batch of tasty cakes, that's where a few of my favourite cheeky time saving cupcake decorating tips and tricks come in handy. When your elbow deep in a giant bowl of buttercream, surrounded by a dozen piles of edible toppings from sprinkles, to glitter, and those all important flavourings & colourings, you start to wonder when it's going to end.. almost inevitably cursing your loved ones and friends who you stupidly agreed to bake a few dozen cupcakes for – you really do appreciate your beloved local bakers all the more after taking on a mammoth baking task yourself! Thankfully though, you can save some time in the kitchen with these rather cheeky decorating cheats! Not all decorating cheats come in handy, especially when your used to making your own, the taste of shop bought spray frosting just doesn't cut it - not to mention the swearathon than will emerge from the kitchen after an hour wasted trying to get that damned stuff out of the packet in the first place.. it's just not worth it. But, a trusty packet of pre-flavoured icing sugar is a thing of wonder, sure it may only save a small amount of time dependent on your chosen flavour, but it's one of those decorating cheats that's as good as it sounds. Take a handy packet of Sugar & Crumbs flavoured icing sugar, simply add your butter/dairy free margarine and whisk - it couldn't be easier! Each packet comes un-coloured, so you can opt to add additional food colouring should you wish. Simply top your bakes with your buttercream as you prefer and you've done part of the decorating work already. They're also gluten, dairy & nut free, and suitable for vegans so a tasty time saver that everyone can use. If you prefer to mix your flavouring in then you can't go wrong with a good quality food flavouring – it'll save time and tears with your bakes! Concentrated flavourings like Beau's are perfect for a good strong buttercream, a little really does go a long way, and you can add some scrumptious flavours to your bakes with ease – simply add to your buttercream and mix as usual. We all love a pretty finish on our cupcakes, but why spend hours agonizing over sugar paste when you could cheat and add some pre-made toppings! I won't scold you at all for this, it's a great time saver with your bakes, especially when you have a few dozen to make! Sugar rose and edible flowers are a lovely way to decorate your bakes with ease, PME do a lovely range of sugar flowers and other pretty edibles for your bakes – from festive trees, to hearts, and pretty butterflies, now all you need to do is open the packet and place them on top of your cakes for a lovely decorative bake! Of course, for an instantly pretty bake you really can't beat a generous handful of sprinkles to top your cakes. Whether you want to go for a batch of pastel toned unicorn cupcakes, or a rainbow of colourful tones you'll really be spoilt for choice for some lovely sprinkles for your bakes. Whilst you can easily pick up a handy tub of colourful sprinkles at your nearest supermarket, you may just want to treat yourself to some scrumptious sprinkles by Cake Angel. These make your ordinary sprinkles look tame. Handy jars of mini fruity sugar cubes, Rhubarb and custard flavoured nibs, and mixed tubs filled with mini jazzies and rainbow confetti - they will most certainly add a scrumptious twist to your bakes! (F.Y.I some of their sprinkles do contain milk, egg, or wheat, so do check the label beforehand). Upgrade your sprinkles with some of these colourful mixes from Iced Jems, From galactic mixes, to pretty shells and yes, even unicorns, an incredibly easy way to make your cupcakes look amazing with a generous handful of these pretty sprinkles! (F.Y.I some of their sprinkles do contain wheat so do check the ingredients beforehand). Another glamorous way to dress up your cupcakes with ease is to sprinkle some edible confetti on top – yes, edible confetti! Rainbow dust make a pretty selection of their confetti's in hearts, sequins, and stars for an easy way to make your cupcakes look glam! They're also gluten, lactose & nut free. It doesn't have to be all sprinkles though, other tasty ways to make your cupcakes look pretty can be incredibly simple and effortless. Baking a tasty batch of fruit-y cupcakes? Tart them up by placing some fruit on top! Sweets are another yummy way to decorate your cupcakes with ease, a simple chunk of chocolate to complement the flavour of your bake works a treat, or why not go the whole hog and top them with a ton of sweets! All you need to do is buy the tasty sweets and place them on top as you like, a deliciously effortless way to easily decorate your bakes – plus you've got some extra tasty treats too, and you could always eat some of the sweets as you decorate, we've all done it! Hopefully, one or two of these tips will save you some time and stress in the kitchen, besides, why spent hour making the perfect batch of cupcakes for that party, when you could be pre-testing those cocktails.. it's just as important a task, honest!